Hadil al-Rafati gently adjusts her anaemia-stricken toddler's frail legs onto her lap in the lobby of an NGO's clinic in Gaza City. The programme providing treatment to her son is among those in the enclave facing cuts or closure due to a freeze on US aid to the Palestinians, organisers say. "He weighs 7.2 kilogrammes (16 pounds), but at a year and a month, he should be at least 10," the 21-year-old mother said of her son, Essam. Since January, US financing for humanitarian programmes serving the Palestinians has been suspended, with Washington saying it is being reviewed. President Donald Trump has threatened to withhold hundreds of millions of dollars in aid to force the Palestinians back to the negotiating table with Israel. On a recent day, around 15 mothers waited in the lobby of the clinic run by Palestinian organisation Ard al-Insan to see a paediatrician or to receive food supplements for their children. Certain services have been maintained with available funding, but the programme is due to expire at the end of August if the money is not released. "They help us, give us medicine," said Rafati, who is unemployed and whose husband picks up odd jobs to make ends meet. "If they close, where will we go?" The Gaza Strip, controlled by Islamist movement Hamas, has been under an Israeli blockade for more than 10 years. The two sides have fought three wars since 2008. 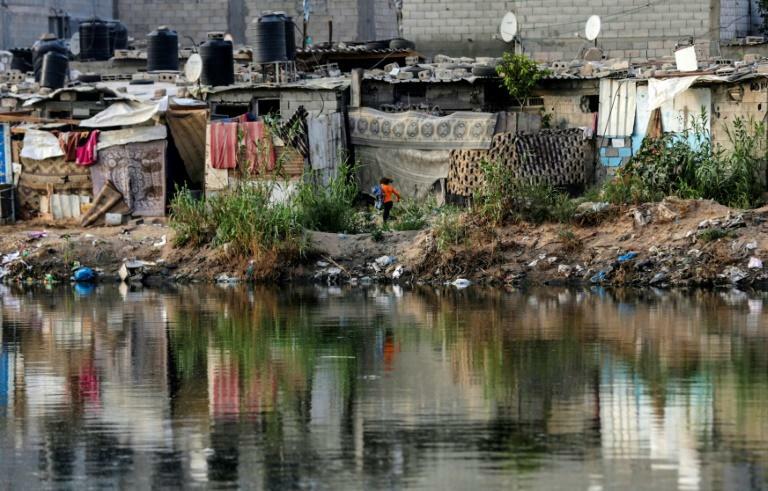 Some 80 percent of the enclave's two million residents rely on aid, according to the UN agency for Palestinian refugees (UNRWA). Trump's comments on aid in January came after Palestinian leaders suspended relations with the White House over its deeply controversial recognition of the disputed city of Jerusalem as Israel's capital. Since then, the passage of a US law in March withholding certain aid to the Palestinians over payments made to prisoners jailed for security offences, or to the families of those killed while carrying out attacks against Israelis, has further complicated the situation. Some $215 million (183.5 million euros) that the United States was to invest in humanitarian aid and development in the occupied West Bank and Gaza Strip has been held up, according to an analysis for the US Congress. US financing for UNRWA has also been blocked. "At President Trump's direction, assistance to the Palestinians remains under review," a US State Department official said. Some programmes are already facing cuts, such as the Palestine Avenir for Childhood Foundation, which has not renewed contracts for some 30 employees since the start of the year. Suffering from cerebral palsy, nine-month-old Maher had been receiving four physiotherapy sessions per week from the organisation. He now only comes twice per week due to a lack of available therapists. "The change has been huge in the last three months," said his mother Nada Abu Assi, 27, as she watches her son move with the help of a support device. The foundation's director, Ahmad Alkashif, said "these are the last beneficiaries," adding that hundreds of children are on its waiting list. The project, financed by Washington's development agency USAID, is part of a $50 million programme started in 2016 and meant to last five years. Some 20,000 patients were to benefit from the plan, with the possibility of extending it to 250,000 in case of disaster. "Unless the funding hold is lifted in the next three months, the 'Health Matters' programme will close, leaving the most vulnerable families in Gaza without even the most basic health care services," said Ky Luu, chief operating officer of International Medical Corps, an American NGO contracted for the programme. The health system in the enclave is already badly struggling. In recent months, it has faced an influx of more than 4,000 wounded Palestinians hit by Israeli gunfire during border protests and clashes. At least 149 Palestinians have been killed by Israeli fire since the protests and clashes began on March 30. One Israeli soldier has been shot dead. "It's another burden that we must carry," said Suhaila Tarazi, director general of the Al-Ahli Arab hospital in Gaza City. Without the US aid, training for surgeons will be cancelled, she said. "Many will wait and suffer," she said, her eyes filling with tears. Each month, more than 2,000 Gazans request permission from Israel to leave the enclave for health care. Last year, only 54 percent of requests were approved and 54 patients died before being able to leave, according to the World Health Organisation. Many fear the loss of US funding will be impossible to replace. "There is no follow-up for projects," said Iyad Abu Hijayer, deputy director of the Palestinian Centre for Democracy and Conflict Resolution. "In general, for years financing has decreased."